After the pain of Iraq and Afghanistan, it is hard to imagine the UK being drawn into another war. Defence chiefs warn that there is a real prospect of future conflict, but they have struggled to persuade most politicians to take them seriously. Our leaders have concluded there are no votes in defence, and have progressively run down the armed forces. Today, the army is at its smallest since the Napoleonic Wars; the RAF is less than half its size twenty-five years ago, and the Royal Navy will struggle to muster the ships and weapons required to protect our new aircraft carriers. Is there really a risk of war? Is our military less capable and, if so, what could that mean for our future? White Flag? explains what has happened to our armed forces in recent years and asks whether their decline endangers our safety and prosperity. "White Flag? 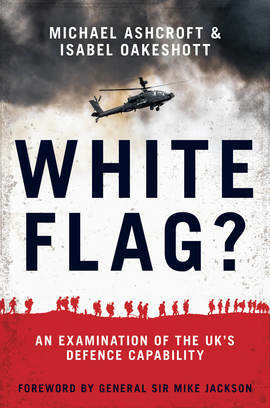 is an absolutely gripping, sit-up-and-listen, no-holds-barred investigation of British military clout. This is the sort of stuff our political leaders, of whichever stripe, should be telling us, but don’t. That it often makes uncomfortable reading is a tribute to the clarity and honesty of its analysis, a bracing change from the routine assurances our political masters dole out about our armed forces, despite rounds of savage defence cuts since the 1980s." “White Flag? offers a refreshing independent analysis of the state of the armed forces, free of the inter-service rivalries that can undermine analysis on this subject. The authors have a unique insight into the political wrangling over defence and how this affects the military. "Politicians may reflect that their role is to shape opinion, rather than be led by it. If there are those in public life who believe that Britain's defence requires more funding, they must step up and make the case; this book gives them plenty of ammunition."